Royal Yacht Squadron wins first leg of the British Isles keelboat Team Racing League. 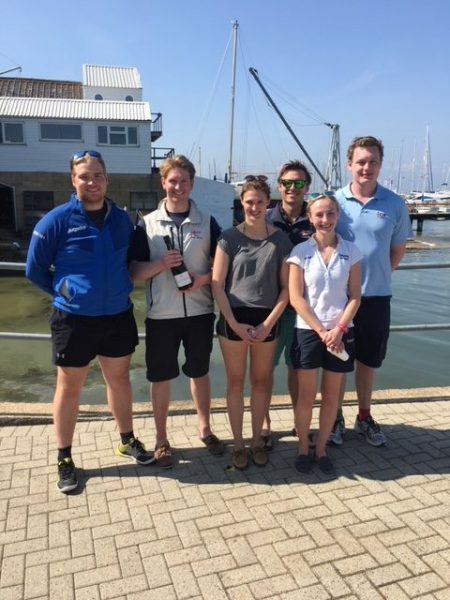 In champagne sailing conditions the Royal Yacht Squadron set the pace by winning the inaugural event of the newly formed British Isles Keelboat Team Racing League. Hosted by the Squadron and sailed in J70’s in Osborne bay, 4 teams fought it out over 2 days in varying wind strengths , but ending in perfect team racing conditions. Using the now well tried and tested 2K format, the teams also experienced racing without RRS 13 (the tacking rule) and with the new World Sailing test rule 16.2. For the first time the event included a Masters as well as an open classification with series points be awarded for equal gender crews. The series now moves to the Royal Northern and Clyde where we hope to be joined by some US entries as well another Scottish Teams. While the league is primarily focussed on British Isles based clubs entries from abroad are also very welcome.